Photo: Girls rescued from human trafficking are learning valuable skills which will allow them to stand on their own as they’re restored to a life full of hope. We are happy to share a miraculous report from our efforts to fight human trafficking in Nepal. This week a 16-year-old orphan who had been living with her uncle had gone missing. Someone in her native village contacted our local team, knowing they work on the border looking for trafficked girls. They provided her photo, and our team kept an eye out for her at our border kiosk from which we look for suspicious activity and distribute trafficking awareness pamphlets. 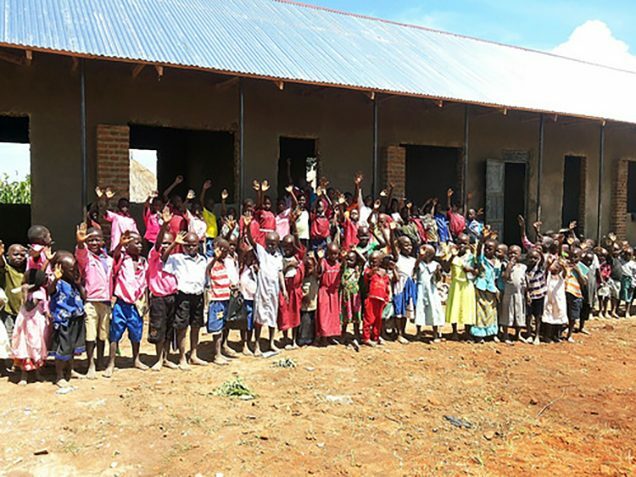 Photo: Children at our elementary school are excited about the new building under construction! We are happy to report that our new primary school in rural Uganda is now fully funded thanks to our generous donors, as well as profits from the farmland. Construction of the new building is almost complete, which is creating a lot of excitement amongst the 200 children enrolled in the school this year. The old building has dirt floors, wooden siding, and a shoddy roof, and floods easily. The new building is a great improvement with an elevated foundation to prevent flooding, and a sturdy roof that will shelter the children even in the heaviest of rain storms. The funds have also provided benches and permanent chalkboards.